Montefiore leads the nation in the treatment of abdominal aortic aneurysm. Our doctors pioneered this treatment almost two decades ago and we continue to treat a large number of patients, many with complex and difficult anatomy. 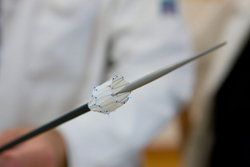 Our minimally invasive approaches use endovascular grafts to treat aneurysms without open surgery when feasible - which may reduce pain, recovery time and complications. Our Thoracic Aortic Aneurysm Center offers patients surgical treatments and the less invasive thoracic stenting method. This advanced approach does not require opening the chest, enabling patients to return home the day after surgery. Montefiore's vascular and cardiothoracic surgical teams have extensive experience in the management of complex aortic aneurysms (both thoracic and abdominal), as well as other rare aneurysms of the arterial branches. This expertise, combined with their ability to offer the most advanced techniques including open, endovascular and hybrid approaches, makes Montefiore's vascular surgeons highly qualified to manage patients with this diagnosis. The aorta is the largest artery in the body. It carries blood directly from the heart and supplies the entire body through its branches. The aorta begins in the chest as blood leaves the heart, giving off branches to the head and arm vessels. It then turns downward and goes through the diaphragm, a muscle that separates the chest and abdomen. The part of the aorta that is located in the chest is called the thoracic aorta. After it enters the abdomen, it gives off branches to the intestines and kidneys. Finally it enters the pelvis where it divides into two vessels (iliac Arteries) that supply the legs and lower body. The portion of the aorta in the abdomen is called the abdominal aorta. A normal aorta measures a little more than an inch in diameter in the chest and a little less than an inch in the abdomen. The aorta is usually a bit larger in men than in women. An aortic aneurysm is a weakening in the wall of the vessel that allows it to enlarge. Aneurysms can be located in either the thoracic or abdominal aorta. In some cases, an aneurysm may involve both the thoracic and abdominal aorta. They may also occur in the iliac arteries, usually in association with an abdominal aortic aneurysm. 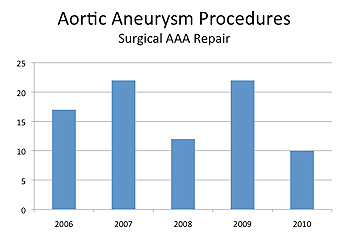 Aneursyms can cause the aorta to enlarge to a size of 5 inches or more. As aneurysms become larger the risk that they can rupture, or burst, and cause life threatening bleeding increases. When this occurs, the aneurysm is said to be ruptured. In these cases urgent surgery is almost always required. Thoracic and abdominal aortic aneurysms may be treated with either of two methods. The older and more traditional method of repair is using a standard open surgical approach. In the case of an abdominal aortic aneurysm, an incision is made in the abdomen or the flank. The aorta is identified and clamps are placed on the aorta before the aneurysm starts and after it ends. The aorta is then opened and a graft is sewn into place to the normal aorta below the top clamp and above the second clamp. The clamps are released and the blood now flows through the graft. The aneurysm sac is then loosely closed over the repair. The aneurysm itself is not removed. The weakened portion is simply replaced with the graft, greatly reducing the chance of rupture. 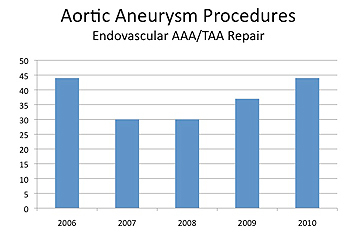 A similar procedure is followed for thoracic aneurysms. Because these aneurysms are closer to the heart it is sometimes necessary to use cardiopulmonary, similar to that used when doing a heart bypass operation. In the newer and less invasive method the graft is placed from inside the arteries themselves. Two small incisions are made over the femoral arteries in the groin area. A stent-graft, which is graft material similar to that described above, mounted with stents that will expand and support the graft is packed into a narrow tube, or sheath, and is introduced through the femoral arteries. The graft is then positioned under x-ray guidance and released into position such that the graft bridges, or excludes, the aneurysm. Again, the aneurysm itself is not removed. In both cases the goal is to exclude the aneurysm from the circulation, preventing expansion and possibly rupture. A similar procedure is used in the case of thoracic aneurysms. In both cases the need for large surgical incisions, clamping of the vessels, and possibly bypass is avoided.